Are you obsessed with braid hairstyles? If yes, you are at the right place. Here, you will have the opportunity of checking out different top notch braid hairstyles. These hairstyles can be incorporated by anyone regardless of his/her age. Furthermore, there are numerous hairstyles to choose from. Below are some top box braid hairstyles worth checking out. This hairstyles encourages plaiting of long braids. Your braid should systematically be directed to rest on your shoulders. The poetic justice braid hairstyle encourages plaiting of big braids throughout your head. The color of your braids should be black. Hold you braids up and divide them into two main parts. Each part should be cling together through a headband before being directed straight up to the shoulder from each side of the head. Poetic justice braid hairstyle blends in with any outfit and can be styled up into different designs. Consider the dirty blonde hairstyle if you want to style up your braids to attain unique and marvelous look. Your braid should be blonde in color. Choose a reasonable braid thickness, depending on your desires and attain it throughout your head. Afterwards, separate your middle head braids with that on the side head and the back of the head. In short, direct your braids towards your hair growing direction with an exception of your fringe hair. Clump your middle head braids together upwards to form a bun look shape. Attention in this hairstyle mostly lies on the left side of your head. The sleek left bun braid hairstyle encourages thick braids. A section of braids on both the left and the right side of the head should conjoin with braids on your middle head and fringe hair. Afterwards, these braids should be coiled together in an uprising manner to form a bun. The rest of your braids should be sleeked towards the left side of the head and should conjoin together before stretching past the left shoulder. As the name suggests, this hairstyle has a bun look shape on the middle head, thus its name. Go for black color braids if you want to attain maximum look from this hairstyle. Go an extra mile and Separate braids on your middle head and fringe hair. Direct it upwards before coiling around your braids on the middle head to form a bun. The rest of your braids should be sleeked straight, depending on its natural growing position. Your front view braids should extend past your shoulders on both sides. This is a very unique hairstyle in that it gives options for styling up your braid. It is characterized by long braids throughout your head. Afterwards, there should be two partition lines that separate braids on the mid head from those on each side of the head. Braids on the side head and the back of the head should be sleeked straight. All braids on your fringe hair should be combed backwards. Some section of your mid head braids should be sleeked towards the right and others towards the left. Numerous women have incorporated this top notch hairstyle at some point in life. Choose any thickness on your black braids. Afterwards, sleek backwards all the braids on your fringe hair, middle head hair and side head hair on both sides of the head. These braids should conjoin on the edge of the mid head and your back head. The conjoining point should attain a round bun looking design. That’s not all; your back head braids should be combed straight. This box braid hairstyle can be used for both official and casual functions. Ever thought of attaining a black braid that stands out from the rest? If yes, look no further. Simply check out the African black braid hairstyle. 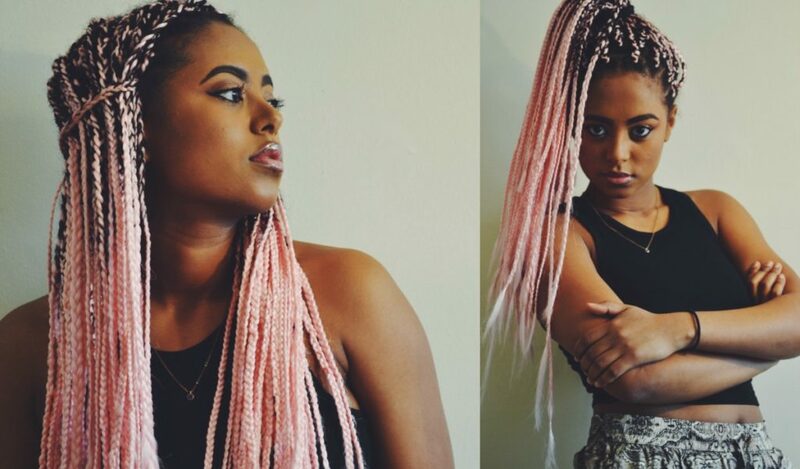 This hairstyle was ranked among the top 25 box braids worth checking out last year. Anyone can incorporate the African black braid hairstyle, provided you have coarse hair that can be plaited. Above all, this top notch hairstyle can be custom made to suit both official and casual gatherings. Make an effort of checking out this marvelous and top notch hairstyle. This is unique box braid hairstyle as it entails plaiting and the use of gel to give your hair a curly look on some section of your fringe hair. Twingled box braid hairstyle is different from other braid hairstyles in two ways. First, your hair is divided into layers before braids are incorporated on your head. In fact, you can comfortable count the number of braids on your head. Secondly, some section of your fringe hair should be given that curly look through the help of a gel. Do you want your head to attain a blend of different colors? If yes, you should check out the mix color braid hairstyle. This hairstyle entails plaiting and incorporation of a cut to separate your middle head braid from that on the left side of the head. You can incorporate white, blue, white and black braids on your head. It all depends on your needs. All your mid head braids should be directed towards the right side of the head. There should be a line that separates mid head braids from those on the left side should extend up to some point deep on your head. Most attention on the Indian love hairstyle lies on the left side of the head. Start implementing this marvelous hairstyle by purchasing black braids. Braids on your fringe hair and mid head should be sleeked backwards towards the back of the head. You should design your mid head braid in a manner it gives you a v-shaped look. Braids on the left side of the head should be sleeked straight. Jumbo braid hairstyle is very complex and should be handled by an experienced stylist. Braids on this top notch hairstyle are characterized by being thick in the beginning and systematically becoming thin as it approaches its edge. Your front view braids should be intertwined together and should be directed towards the right side of the head. This trend should systematically progress up to some point before your braids are divided into two main parts. One part should be sleeked towards the right shoulder and another towards the left shoulder. Are you looking for a simple box braid hairstyle that is easy to attain? If yes, look no further. Simply check out the shinny star hairstyle. It is characterized by a deep line that separates your front view hair into two parts. This line guides your stylist on the direction your hair should face. Your braids should be sleeked either on the right or left side of the head, depending on its position. You can spice up the look of your braids by adding some hair appliances. As the name suggests, this is actually the simplest braid hairstyle. You can attain it within a short period, when compared to other hairstyles. It is characterized by thick black braids throughout your head. There should be reasonable gap between each braid. Moving on, your side head should be directed straight towards the shoulder. The rest of the head hair should be directed in any direction, depending on your preference. Simple box braid hairstyle can be used for both casual and official functions and can be easily converted to complex hairstyles. This box braid hairstyle is a combination of silver and black braids. Silver braids should be attached on the sides of your head, whereas the black color should be attained from your fringe hair to the mid head. You are encouraged to attain thin braids. Semi-pussycat hairstyle is suitable for women who want their braids to remain within their neck region. All your braids should conjoin at some point on the edge of your middle head and be conjoined by a hair band. Thereafter, your braids should be divided into two parts. One part should be combed towards the right side of the head and the other one on the left. Are you so much into fashion? If yes, you should consider this top 20 best box braid hairstyles this year. This hairstyle was ranked among the top box braid hairstyles this year because of its flexibility and uniqueness. You can attain different styles with this hairstyle. Above all, your braids should extend up to your knees. Braids on your mid head and fringe hair should be sleeked backwards, whereas those on the sides should sleeked straight and should extend up to your knees. This is a causal hairstyle. Center parted braid hairstyle guarantees you uniqueness among your peers. There should be a line on your middle head that acts a boundary for the braid on the right and left side of the head. This hairstyle is unique in that your braid decreases in thickness as it approaches its edge. You are required to sleek straight braids on your side head be held together on each side by some section of the back head braids. Afterwards, it should stretch past your shoulders. This is among the highly ranked box braids this year. It is suitable for women who love very thin braids. Anyone can incorporate this marvelous hairstyle provided you have coarse hair that can be plaited. That’s not all; small braids hairstyle can be custom designed to meet your needs. This is in terms of braid color and styling up. Above all, you can choose the length of your braid. In addition to all these, small braids perfectly blend with any outfit. This is the reason women at encouraged to incorporate this top notch hairstyle. Beau box braid hairstyle is what you need if you are looking for a hairstyle that can be used for both official and causal gatherings. Start off by incorporating black somewhat thick braids on your head. Thereafter, sleek straight side head braids, past your shoulder on both sides of the head. Braids on your fringe hair and mid head should be sleeked in a slanting towards the right and should rest at the back of the head. Make an effort of checking out the beau box braid hairstyle. This is an easy to attain causal braid hairstyle. It is characterized by red looking braids that give you a lively look. The red bun box braid hairstyle encourages plaiting of thick braids. Plait your entire head to attain red braids. Afterwards, sleek your entire head braids to conjoin at some point on your mid head. Go an extra mile and conjoin your braids together and form a bun. The urban box braid hairstyle is characterized by zigzag cuts in between your braids on the head. Your braid should have a blend of brown and black color. This feature makes it be ranked among the top modern hairstyles. Additionally, there are numerous designs you can sleek this urban hairstyle. You can either leave it hanging past your shoulder or sleek it upwards and hold it with hair bands. The blend of brown and black color on your braids makes you stand out from your peers. This is the most flexible box braid hairstyle. First, you can give your black braid either a pussycat look; that is described with two bun looks and your back head braids flowing behind your back. Alternatively, you can design a single bun on the mid head and your side head braids should be sleeked straight. That’s not all; this hairstyle also allows you to attain the princess look. It is characterized by most of your head braids being sleeked backwards and the rest of the braids should form a crown like look. It is definitely worth checking out. This unique pussycat look encourages your braids to reach the neck region. It is characterized by silver braids, spread throughout your head. All the braids on the middle head and fringe hair should be divided into two parts to form unique bun looks. The braids on both sides of the head should be sleeked straight up to your neck region. The same case applies to the braids on the back of your head. The unique pussycat hairstyle is purely casual but can be custom made to suit official functions. Women have incorporated this hairstyle at some point in their life, isn’t it? As the name suggests, this top notch hairstyle encourages twisting of your plaits instead of plaiting. This hairstyle focuses on attaining systematically arranged braids throughout the head. Above all, there are numerous designs to choose from as far as the lovely twisted box braid hairstyle is concerned. You can sleek right or left braids on your mid head. The lovely twisted box braid hairstyle is considered both an official and casual hairstyle. So, what are you waiting for? Are you one of the few women in the society who love uniqueness? If yes, check out this top notch hairstyle. It is characterized by purple braids on your head. This trait automatically makes it a casual hairstyle. Your purple braids should be long and should extend past the shoulder. Additionally, the Justin Sky braid hairstyle is characterized by most of your braids being sleeked towards the left side of the head. Braids on your middle head should be sleeked towards the left side of the head to conjoin with those on the left. The rest of the front view braids should be sleeked behind the right ear. As the name suggests, this hairstyle has some jewelries on your long braids. These jewelries should be unevenly distributed throughout the head. First, you must attain black braids that reduce in thickness as they progress towards their edges. There should be a partition line on the mid head that separates the front view braids into two different parts. Your mid head braids should be sleeked toward the right side of the head and should conjoin with those on the side of the head. Lastly, they should stretch past your right shoulder. This hairstyle traces its origin from Asia. It is different from other box braids hairstyles in numerous ways. It is characterized by an acute angle look on each braid. This means that your braids are spacious and should be twisted instead of being plaited. You should incorporate long braids that extend past the shoulders. All the braids on the mid head should be sleeked towards the right side of the head, to conjoin with those on the side head. Braids on the left side of the head should be sleeked behind the left ear. As the name suggests, this hairstyle is characterized by long pink braids. You should accustom this hairstyle if you desire to attain a colorful hairstyle. Your braid should attain a pink and a black look throughout the head. Women are encouraged adopt this hairstyle as it can be designed into different styles. The first style entails dividing your front view braids into two main parts. One section should be sleeked towards the right and the other towards the left. The other style is characterized by hair being sleeked upwards and being conjoined together. This type of braid looks similarly to your natural hair. There are some people who cannot differentiate this braid from your natural hair. You need an experienced stylist to give your hair that natural look. This hairstyle encourages twisting of braids rather than plaiting. Braids extending from your fringe hair, mid head hair and some section of your side head hair should be sleeked backwards to conjoin with braids on the back of the head. Afterwards, it should stretch up to the back of your shoulder. The rest of your side head braids should conjoin together and hold this long braid. Are you looking for trendy box braid hairstyles for last year? If yes, look no further. You are at the right place. A woman’s hairstyle determines how people in the society perceive you. Being trendy is one of the ways of standing out from your peers or group. Above all, you will also stand out from the society because very few people flow with trends. Make an effort of checking out these spectacular and top notch box braid hairstyles. As the name suggests, this hairstyle focuses on giving your hair black long braids that are sleeked left beyond your shoulder. Your braids should be uniform in terms of thickness on most part and can be incorporated with jewelries to give it a dazzling look. Afterwards, most of the braids on the mid head should be sleeked towards the left side of the head. The rest of the front view braids should be sleeked straight. This should be considered a multipurpose hairstyle in that it suits any function, whether casual or official. Are you a fun of braids that are not completely plaited? If yes, check out the one side swept braid hairstyle. It is characterized by long black thick braids which are left partially unbraided at some point, throughout the head. Simply sleek all the braid on your head towards the right side of the head. This is a unique box braid hairstyle because it can be custom-made to other hairstyle to suit your current event. Make an effort of checking it out. This box braid hairstyle is common among African women. It is characterized by a partition line that divides your front view hair into two parts. Afterwards, you should sleek all your braids sideways. Proper African braid hairstyle encourages adaptation of long braids. That’s not all; these braids should be thin and should be uniform throughout the head. Lastly, sleek straight all the braids on the back of the head. This is one of the few box braid hairstyle that encourages spacing of braids throughout the head. The thickness of your long black braid systematically reduces at it approaches its edge. Some section of your mid head braid should be sleeked towards the right side of the head and the rest towards the left side of the head. All the braids on your head should be directed towards the back of your head up to your back. As the name suggests, this hairstyle focuses on giving you a tail like look that stretches from the back of the head towards the left side of the head and rests on the shoulder. All the braids on your head should be directed towards the edge of your mid head. Conjoin your braids at this point before dividing your braids into two main parts. Afterwards, plait them as they run down to your left shoulder. Choose this box braid if you want it to enhance the looks on your face to give you a marvelous look. Systematically adopt thick braids that reduce in thickness as it approaches its edges. Divide your head hair into two main sections. One section should be directed towards the left shoulder and the other one on the right shoulder. Use different techniques to enhance the looks of this hairstyle. Start off by plaiting thick red braids throughout your head. Afterwards, conjoin together braids on your fringe hair, mid head hair and a section of braids on both sides of the head. Thereafter, divide your braids into two main parts. Go ahead and form a bun look on each part. The rest of braids on your head should be sleeked straight. This top notch hairstyle is common among different highly ranked international celebrities. It is therefore worth checking out. It is characterized by all the braids on your mid head and fringe hair being directed towards the right side of the head. Additionally, you should let these braids extend past your shoulder. Braids on the left side and back of the head should also be directed towards the right side of the head. As the name suggests, this is a delicate hairstyle and should be attained through the help of a professional stylist. All your braids should be conjoined together at the edge of your mid head. Afterwards, you should form one round bun. Use pins to hold the big bun together. Lastly, you can use this hairstyle on any event. You are supposed to shave off all the hair on your side head. This applies to both sides of the head. Incorporate a blend of black and brown braids on the region with hair. Afterwards, start plaiting your backwards to form a Mohawk look up to the back of the head and should extend up to some point on your back.